I lost my tooth yesterday and I put it under my pillow. This is my last tooth I have to lose. I thank you for your many kind gifts and money. Now I need to ask you for something special! Please bring me the NEW! Doctor Mayer Kids Toothbrush. I cannot lose my future new teeth so I have to take good care of them. 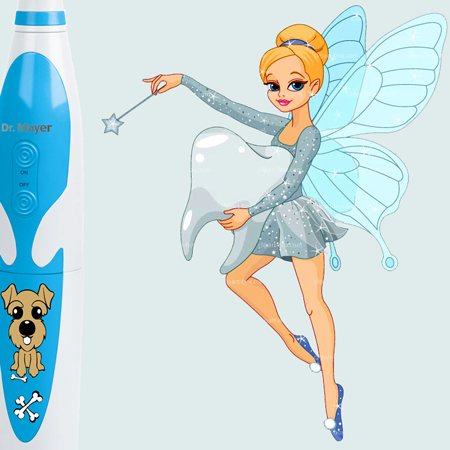 The NEW GTS1000K Dr Mayer Kids electric toothbrush, teaches children to brush their teeth and follow recommended brushing time. The toothbrush is equipped with soft bristles , specially designed for children and comfortable handle that fits easily in the hand of a child. The perfect way to involve your child in an enjoyable and effective tooth brushing. Dr Mayer Kids with “Advanced Oscillating” technology , 8800 rpm will help your child to cover all the hard to reach areas and to achieve the recommended brushing time..